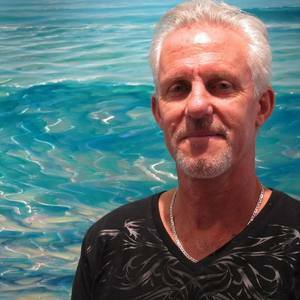 David was born in Berkeley California and raised on the California coast. Since 1974 he has lived in New Zealand and Australia. His work hangs in collections throughout Australia and New Zealand, and in Europe, China, Japan, Singapore, Calif, and New York. Largely self taught and influenced by many Old Masters and nineteenth artists like Frederick Church and Turner, David has always had a strong artistic and spiritual connection to water, light, and the special environment that surrounds him. With many exhibitions and commissions behind him, he has won the 2010 d'Arcy Doyle Art Award in Queensland for his work "Liquid Radiance', he has won the People's Choice Award at the 2011 Swell Sculpture Festival in Queensland for his Sculpture "The Ocean Cubed" and he was chosen as one of the artists to paint the ceilings and walls of a palace in the Ukraine in 2006 - among many highlights. Working predominately in oils on polished aluminium for many years, David creates paintings that are unique, inspirational, and reflect the beauty of the natural world that we have all inherited by virture of being alive on this planet.